Could you, after having taken the civilian version of our Remote Viewing and Remote Influencing course, perceive the future? Certainly. But it will be the probable future. The nearer the specific prediction or the more global it is, the more accurate it will be. With the Remote Influencing course, you will learn to influence the probable future and shape it to your desires and liking. In order to do this you need to learn to operate in states where your brain waves are slowed down to Theta (4.5 brain wave electrical vibrations per second which is the border to human sleep) or even past this to Delta (brain waves of 1-4 cycles per second) where almost no human could stay awake before until we taught our students, in our ground breaking Remote Influencing course, how to remain aware and operate fully in it (when their brain slows down below 4 electrical vibration per second). Could you also Remote View the past? Yes, you can easily experience again the past. Our remote viewing techniques allow one to break the time barrier. Either backwards or forwards. And see the past and/or the most probable future. Your mind can instantly connect to either. We teach you to do this by learning to connect to the Universal Collective Mind operating as a background field below your usual human conscious awareness (intellect) . This is done by slowing down your electrical intellectual linear thinking brain to levels where the information field present in the background radiation (Universal Mind) can come up to the surface without being blocked by the usual Human Brain/Mind chatter. Do our courses automatically increase your intuitive powers (6th sense)? Yes, and greatly so. Actually the term “Remote Viewing” is somehow of a misnomer. It should rather be called “remote sensing” or “remote intuiting”. The “viewing” might only happen as you decide to sketch the information received. It teaches you to listen to the little voice inside of you that goes beyond time and space and, since it cares tremendously about you, tries to forewarn you of impending disasters and put you on better paths in life. This same level of mind can connect , if necessary to any point in time/space. Our techniques increase the volume of that “little intuitive voice” up to a point where it becomes an integral part of your life and you then learn to listen to it and trust it. Numerous research studies at many numerous prestigious universities have unquestionably proven that most highly successful human beings active in any endeavor that requires fast and important decision making (health professionals, businessmen, financiers, military strategists, army commandos and field commanders, world leaders, etc . . .) were likely to have learned to listen to this very deep level of “Remote Intuiting.” They literally would sense the future, other people, and then act accordingly in order to experience a better present for themselves and the ones they care for. Could you visit, through our Remote Viewing technology, remote sites, located on earth and/or space almost as if you were there physically? Yes, in perception. The space barrier is very easily breached using the faster than light speed (infinite speed i.e. instant connection) of thought. This was one of the most important applications of mental espionage i.e. remote viewing. However, for very advanced remote viewers, the sensory apparatus becomes restricted to sight (360 degrees around), and thought reading (including emotions) and communicating. Most trainees experience mental sensory connectivity to the targets of interest. A great many of our students (around 40 percent) experience bi-locations in the form of OOBE (Astral Projection) (see our trainees’ feedback). Some have remote viewing experiences while dreaming or while having lucid dreams (very frequent). High level learning and knowledge becomes available, originating from the deep Universal Mind. Could you connect, using these Remote Viewing and Influencing techniques, to the thoughts and emotions of other individuals and perceive them clearly? Yes, since one can, by placing oneself at the interface of the Universal Mind that connects all life forms and operates outside of the realm of linear time/space, connect to any point of perceptual linear space and time, and process the data originating from any individuation of the Universal Mind. Could you, then, if you so desire, influence their deep level thoughts located within their subconscious mind, hopefully for productive purposes? Yes. However, a warning is in order: The Deep Collective Unconscious or Universal Mind that allows that type of instant communication has its own rules of right and wrong which, although different from humankind’s myopic perception, cannot be bridged but must be understood by the remote viewer. Why is our course offered in an audio format, as opposed to other media or even a personalized workshop? We feel that, besides being by far more affordable than accelerated seminar training, having the ability to train in the comfort of one’s own surroundings, makes for a more relaxed and less self-conscious atmosphere. Group training often brings active conscious peer-pressure demands on a passive subconscious process such as remote viewing. Even though it sometimes allows for one to be swayed to success by witnessing others achieving commendable results, it often leaves the trainee in a bind as he/she returns home only to find out some weeks later that the crash training was too intense, requires much more expensive repeat refreshers, and often ends up being forgotten. In addition, our home training approach allows for more sustained results. The student can always repeat, for a lifetime, the material at his/her own leisure, and ends up making the RV/RI abilities become “second nature.” We use audio material because we feel strongly that, at first, one needs to achieve these deep states of mind operation without being disturbed by daily visuals, and that having the eyes closed in a receptive contemplative mood, while passively listening to audio instructions, is by far more efficient. Could you forecast, using specialized techniques of remote viewing such as ARV (associational remote viewing), with a significant degree of success, lottery numbers, foresee winners at racing events, perceive future prices of stocks, DJIA, commodities, bonds etc.? Definitely yes. This was done successfully under stringent laboratory controls, at major research centers, by remote viewers that achieved an almost 100% accuracy at trading the silver futures markets. Similar experiments were successfully carried out on horse betting. Russell Targ, one of the original remote viewing researchers at the Stanford Research Institute also mentions having won a lottery on his first try at remote viewing. Many of our trainees have had success at lotteries, especially the pick-three numbers ones. Gerald O’Donnell, founder of the Academy of Remote Viewing, easily reproduced the experiments in the commodities and stock markets. He believes that, although one can create a much better future and foresee the near-term web of possibilities, nothing is random in the processes of this planet, even though they might appear so. Remote viewing (sensing) of the directional moves of financial markets, whether actually traded or not, is an excellent training tool for potential remote viewers that Mr. O’Donnell highly recommends since it involves major global worldwide situations within the events’ matrix. It reflects, by definition, the collective expression of mass psychology, which is what a remote viewer taps into. The more major and the more proximate a market move is, the more vivid, consistent and accurate the remote viewing of it will be. Could our Remote Viewing and Influencing methods greatly enhance your healing powers? Could you easily rid yourself - using the core of our methodology of Remote Influencing - of self-destructive habits such as smoking, chemical addictions, overeating, unmanageable fears, undesirable behavioral patterns etc.? Yes, if it is really what the controlling deep level of your mind wants for you. It needs to accept to override your low-level conscious mind’s destructive influence upon your life. Instead of having entered a destructive path, you should be able to operate at a high level of mind where you are one with that level and implore it to impose a change in the program of your life, and deprogram yourself from past destructive memories. You are always, ultimately, the master of your fate. No matter what anyone else says. Do not take our word for it, but experience it. Could you attract, using these same Remote Influencing methods, persons of the opposite gender that you desire, by acting upon the higher levels of their minds without their being conscious of it? In most ways and instances yes. However if their subconscious mind is strongly opposed to it, you may have a hard time convincing it to cooperate. 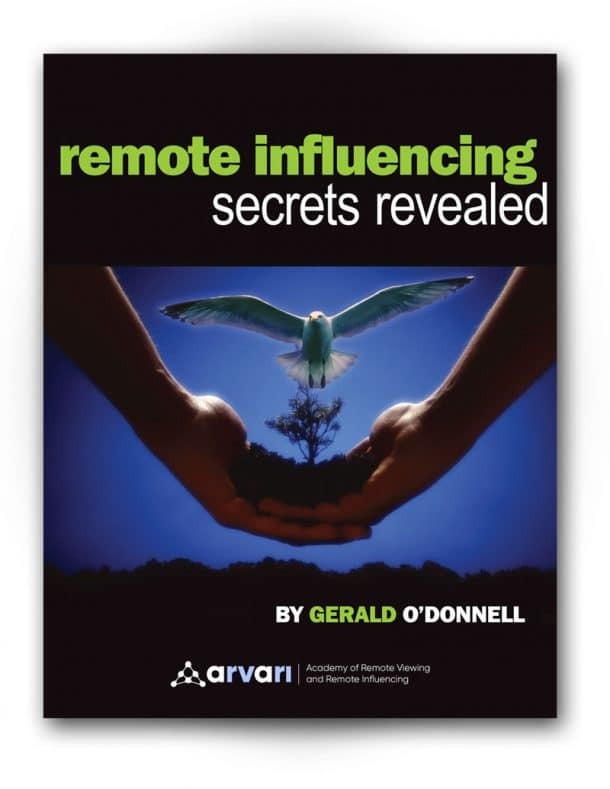 Could Remote Influencing help you mold a better future for yourself? Yes. It is one of the main goals of the Remote Influencing Course taught by the Academy of Remote Viewing. This is truly a life-changing experience. One can only become aware of one’s immense potentials by experiencing them. Pondering or reading about them will achieve nothing. Could you acquire a photographic memory and greatly enhance your academic achievements through these Remote Viewing and Remote Influencing techniques? Definitely yes. All permanent memories are stored within the deep subconscious and not within the physical apparatus of the brain, especially deeper and older permanent memories. The brain can only trigger recall as it sends electrical informational requests through electrical nerve chemical impulses and brain mapping. Believing that the brain is the only source of mind is one of the major scientific blunders of our modern times and an impasse of major implications. The brain is the source of human slow linear intellect, but not of Mind. The biological correlations are there and shown within the level of the brain. But that is all they are: correlations, not the source and inspiration. The brain is really a biological thought computer operating in a restricted perceived time/space construct a linear AI type of intelligence, learning from past mistakes in a reiterative manner. In order to exist and operate it needs to be connected throughout what we define as life to to real Infinite Light intelligence (universal Collective Mind which many call Spirit) operating as a background reality. It does so through many connective pathways operating mainly out of our DNA which is in reality a quantum computer made up of vibratory Light strands. These connective paths are only recently starting to be recognized by the frontiers of science. Our whole incredible human apparatus is but the Creation and epiphenomenon of the Universal Mind/Collective in which we all bath. No exception to that, whether we believe in It or not. Could you achieve without any effort, using specialized Remote Influencing techniques, the ideal weight that you desire? Can you experience that by operating at the desirable creative level of your mind, you automatically let go of obsessive fears and anxieties that reinforce and energize the physical and subsequent mental vicious circles you imprison yourselves within by thinking about them too often? Can you be made to actually experience and realize the fact that you may actually be constantly creating the reality that you fear and use this as an excuse to be unhappy? Most definitely yes. One can, by positioning one’s awareness at a level of the subconscious data stream below its programming level, reprogram one’s mind and hence change one’s reality. One is constantly creating one’s reality. For good or for bad. Either consciously aware of it, or only subconsciously aware of it. The act of becoming consciously aware of this incredible creative power allows one to control it. And hence control his/her life. The level of mind achieved through our Remote Viewing and Influencing training allows for such a control to take place, as needed. Nevertheless, all these newly found capabilities are but a byproduct of a certain state of mind that the remote viewing and remote influencing courses teaches you to operate constantly in. And hopefully soon you will change priorities and get a deeper understanding of why we are all here.